As part of our trip to Madrid, we stayed on for the weekend, and took a day trip to Toledo. This is probably our moment to make a plug for the Spanish trains, which got us to Toledo in a very short space of time, and are also very comfortable. It showed us also how the landscape to the south of Madrid does remain fairly flat, although we had some hills to climb within Toledo itself. 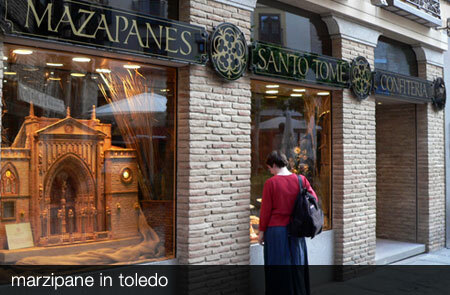 Toledo is known for making swords, but also for marzipan – good news for me! We had to take a photo of one of the specialist shops, which had a model of the front of Toledo Cathedral. Given that the cathedral is huge and detailed, that’s quite a modelling job. We were happy to sample some marzipan, just to make sure the batch was up to scratch. We enjoyed seeing a whole range of architecture, including an early mosque, a Sephardic synagogue and some more classical European buildings. There were also others with Visigoth influences, although we didn’t manage to see them too. Here’s a couple of pictures to show off the marzipan – and the surroundings it’s made in.